A little dated, right? The white border is not to my taste, and the pink wallpaper above the chair rail is pure ’80s. Well, the time has come to change that. So how do I go about that project? Pick a new paint color. If you don’t have an artist’s flair and love dabbling with shades, I recommend going with a palette that appeals to you. 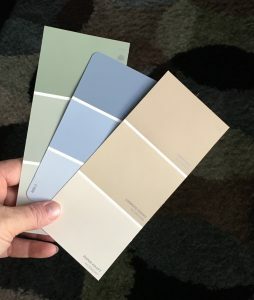 Paint displays at the store will have idea pamphlets that give you a bunch of tints that coordinate well. You can browse for the one you like best, then keep that for times when you need to choose a color. Whatever is on the palette will work, so it’s a safe choice. I have used an even more limited palette in our house — being more neutral than colorful myself. Do what works for you. I went with the medium green below the chair rail and the lightest tan above it. Prepare your wall. Take off all the outlet covers and curtain rods, and take down anything hanging on the walls. Spackle where needed to cover nail holes or gouges. If you use painter’s tape, line your edges now to get ready for a clean line when you paint. Set out your drop clothes, if those are needed. Gather your materials. If you refresh your paint regularly, you probably already have brushes, pans/liners, paint keys, and such in storage. If so, you’ll just need to buy the paint. 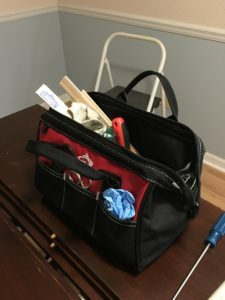 If not, have a good, angled trim brush, a roller with a cover, a roller tray, a cup for trim paint, and a wet rag available, along with your paint. If you’re new to this, you can watch a few how-to videos online or ask a friend for tips. Paint the wall. Use your angled brush to outline the edges of the section you are painting. You only need about the width of the brush on the edge, since the roller will cover the rest. Paint around the outlets or any small interruptions in the wall also. Then you roll. Start at one point and continue on around the room until everything is evenly covered. Put on a second coat or touch-up. Once the paint is completely dry, check your coverage. Sometimes you need to repeat the previous step entirely for a second coat. Sometimes you just need a chip brush to blend in a few spots. 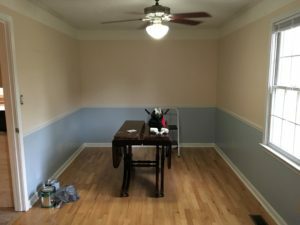 Either way, make sure you lightly blend the second coat so you don’t have paint ridges on the wall. Put the room back together. 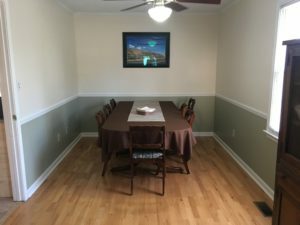 Once the paint is complete and dry, you can put all the outlet covers back on and replace the furniture. It can be done. You can do it too. And when you have done it, enjoy your brand-new look! Remember the studio project of 2017? Well, it has been thoroughly enjoyed since it was completed. Each month a group of us get together in the studio one Saturday and work on creative projects — quilts and more. It is a good time to be together and to make progress on the various projects. We enjoy both the conversations and the time to create beautiful things. This month I worked on some Christmas gifts using a pattern I had seen several years ago. After finding the instructions online, I gave it a shot and loved it! 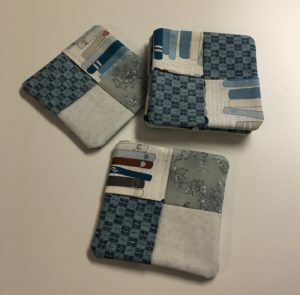 These are coasters using scrap fabrics I had on hand. The directions were simple and clear, so I didn’t get frustrated. They turned out quite nicely. The instructions I used can be found here. 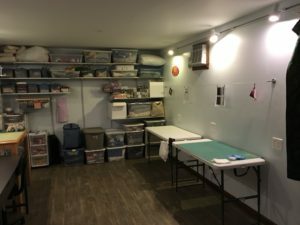 2019 holds more quilting projects, including several baby quilts (love doing these!) for friends who are expecting, and more time crafting together. I look forward to diving back in after the holidays. What have you been enjoying creatively lately?